Ah, the holidays: lively carols, festive decorations, pumpkin-spice everything – and buying gifts. Yes, ‘tis the season for shopping – and right on cue, TicketsatWork is debuting an exclusive collection of Cyber Week deals for theme parks, outdoor adventures, tours, shows and family vacations from coast to coast. Now through December 1, our Cyber Week savings offer up to 60% off! Here are the amazing savings from TicketsatWork for Cyber Week, so you can begin checking off your holiday list. TicketsatWork features six locations nationwide. For Cyber Week, Kid’s Go Free! (with adult ticket). SEA LIFE aquariums are fantastic family attractions with stunning marine habitats and displays. 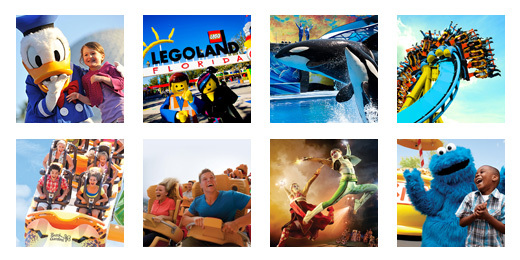 For all the little Lego enthusiasts, TAW is featuring 55% savings on a 1-Day Admission to Legoland Florida, which features a 150-acre interactive theme park with more than 50 rides, shows and attractions, restaurants, shopping, a breathtaking botanical garden and water park all geared to families with children ages 2 to 12. Treat the whole family to a production of Luzia by Cirque du Soleil. A unique blend of high-flying acrobatics and dazzling stage design, Luzia has wowed audiences across the world. During Cyber Week, nab awesome deals to shows in Los Angeles (save over 30%), Costa Mesa (save over 35%) and Washington, D.C. (save over 40%). Volta, another splendid Cirque du Soleil production, is set to play Miami – save over 35% on select seats – from December 15, 2017 to February 4, 2018. In Tampa, save over 30% on select seats – the show runs February 15, 2018 to March 18, 2018. Volta weaves acrobatics with a stirring melodic score for an evening to remember. It doesn’t get more imaginative (and fun) than a night out with the talented trio of blue bald guys who make up the global sensation Blue Man Group. An energetic blend of art, technology and music, the best way to understand Blue Man Group’s worldwide popularity is to see the show for yourself. Pick up your tickets today from TicketsatWork.com and save over 40% to see this sensational show in both Chicago and New York City. 4 Day Disney World Base Ticket – Extra Day Free!5 Day ticket for the price of 4 Days! Ski season is heating up, and Cyber Week has a host of terrific savings for lift tickets and lessons at some of finest ski resorts nationwide. Dust off those skis and set sail for the snowy mountains. Shawnee Mountain (East Stroudsburg, Pennsylvania) – Limited Time Offer on a Learn to Ski/Board Package! Stratton Mountain (Stratton Mountain, Vermont) – Black Friday Deal – Special 3-Day Lift Ticket! Monarch Mountain (Monarch, Colorado) – Save over 40% on Lift Tickets! Mount Snow (West Dover, Vermont) – Save up to 50% on Lift Tickets! Mountain Creek (Vernon, New Jersey) – Preseason Offer! Save up to 55%! Experience scream-inducing thrills in all shapes and sizes at five different Cedar Fair parks across the nation with five different Cyber Week deals too hard to pass up. Cedar Fair – Cedar Point – Save over 50% during the Cedar Point – Cyber Week Sale! Cedar Fair – Dorney Park – Add Fast Lane Plus for only $11 during the Cyber Week Sale! Cedar Fair – Kings Dominion – Add Fast Lane Plus for only $15 during the Cyber Week Sale! Cedar Fair – Michigan’s Adventure – Add Fast Lane for only $10 during the Cyber Week Sale! Cedar Fair – Valleyfair – Add Fast Lane for only $10 during the Cyber Week Sale! The holidays are synonymous with the Christmas Spectacular Starring the Radio City Rockettes. The 84th edition of the Christmas Spectacular has kicked off the season – and now’s the perfect time to catch a performance of this magical tradition in NYC. Even better? During Cyber Week, you can save over 40% on tickets. With several different locations around the country, Madame Tussauds is a must on your next date night. Get up-close to your favorite celebrities, snap zany selfies and enjoy a fun and quirky experience at the world’s most famous wax museum. With specials in Miami, D.C, San Francisco, NYC and beyond, Cyber Week on TicketsatWork is bursting with amazing deals. TicketsatWork is the leading Corporate Entertainment Benefits provider, offering exclusive discounts, special offers and access to top attractions, theme parks, shows, sporting events, movie tickets, hotels and much more. TicketsatWork also powers Plum Benefits, providing a fun and truly unique benefit to over 40,000 companies and their employees. Enter your email address to follow the TicketsatWork blog and receive notifications of new posts by email.